Thinking about the absurdity of last night’s seance involving the remains of Bolívar lying in the Panteón Nacional, a minute ago it suddenly hit me: what exactly was the Prosecutor General doing there? We saw the pictures of the forensic team apparently taking a sample from the remains of the Liberator. 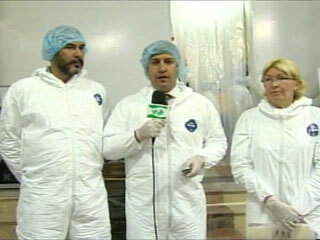 We snickered watching Prosecutor General Ortega, all dressed in white like the villains from E.T., but carelessly forgetting her hair net. We recoiled in pena ajena reading Chávez’s over-the-top live tweet of the event. But only when you stop to think about it does the absurdity of the whole thing really sink in. It’s no secret the motivation behind this whole chou is the fact that Chávez thinks Bolívar was murdered, and so, in his mind the Prosecutor General had to be there. It is a crime scene, after all, right? In its own warped, chavista way, this is somewhat logical, but still strange to the rest of us. The only problem is…the Prosecutor General is in charge of, you know, prosecuting people. Living people. Exactly who is Luisa Ortega expecting to prosecute when the obviously unbiased forensic team delivers its testimony to history that Bolívar was poisoned? The only rational explanation – if such a thing exists – would be that Ortega was there to prevent a crime from happening or evidence from being tampered with. For example, sometimes when they come to sack your house looking for stuff, usually there is a Fiscal del Ministerio Público there. But that happens when there is an ongoing criminal investigation. That is not the case here. The investigation into the causes of Bolívar’s death is something of historical interest: an archaeological amouse bouche. It is not a crime scene, and it is not part of an ongoing judicial process, because all plausible suspects are … how to say this tactfully? The final possible explanation is that the government needed someone there to watch over the proceedings, make sure everything was kosher and ensure none of the remains of the great (and some not so great) men and women of our nation was tampered with (particularly not the lump of soil we now call La Generala). But if that were the case, it should have sent the Manager of the National Patrimony, or the head of the National Parks System, or the Head of the Morgue, or whoever the hell is in charge of the Panteón Nacional. If it wanted to make a real political show out of this, it could have even sent one of the dozens of Ministers in the Cabinet. But Luisa Ortega Díaz? Why did she have to be there? we are governed by a band of lunatics.